Patching drywall is an important part of maintaining the value of your home. Sudbury Handyman services is here to help you handle drywall repair tasks to preserve your home's value and to let you focus on what's important. Our drywall contractors arrive ready to work on the project until you're satisfied.Cracks from settling, water damage, or problems from general structural wear and tear - Sudbury Handyman Services drywall contractors have seen it all. 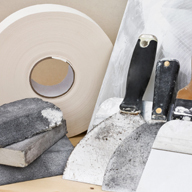 Letting drywall repairs remain on your "To Do" list can lead to further damage down the road. Don't wait - have Sudbury Handyman Services take care of your drywall needs. Sudbury Handyman services drywall contractors can perform multiple drywall repair tasks. Our drywall finishing services can help you put the final touches on a recent remodeling project, while our drywall repair service focuses on fixing the cracks, holes, and wear and tear that occurs throughout your home as the years go by. Let Sudbury Handyman services take care of your drywall needs. Our professional drywall contractors are trained to handle your drywall repair jobs. Give us a call today to set up a time for your "To Do" list to be finished on time and done safely. New drywall puts the finishing touches on your remodeling project, but now it's time to put the finishing touches on your drywall. One call to Sudbury Handyman services does it all with one call.Sudbury Handyman Services can schedule a professionally trained handyman for a visit that can complete all your drywall finishing tasks and handle other items on your "To Do" list. It's that simple! Are you thinking of turning an unfinished space into a usable and livable room? Sudbury Handyman services offers professional drywall services that include repairing and installing drywall so that you can create the space you've envisioned. Our professional drywall contractors are all company employees who are fully traind and offer a full guarantee. Call (705) 919-8095 today. From drywall repair to finishing, Sudbury Handyman services can help with your drywall problems. So give us a call. As always, we'll take care of your job on time and done safely. Drywall has a significant role in your home. When properly installed, it can give you added living space and a smooth, solid surface. Some common reasons why drywall becomes damaged include water, removal of a wall covering (like wallpaper or paneling), and improper installation. Our drywall contractors arrive on time and ready to work. You won't need to call different specialists for each aspect of drywall repair. Sudbury Handyman Service will inspect the work, fix the issue, and finish it. One call does it all ! Our professionally trained handymen aren't just your average handyman for hire. These drywall repair experts will help you with your "To Do" list, making sure it's finished according to your satisfaction on time and done sefely. We offer both half day and full day rates, so when Sudbury Handyman Service finishes your drywall, we can move onto the next item on your list. This knowledge helps build your trust in our. Handyman professionals, and also helps maintain the value of your home.If you've noticed any cracks or holes in your drywall, it's time to call Sudbury Handyman Service and find the time that fits your schedule.Spend your time doing what you want to do - call Sudbury Handyman Service at (705) 919-8095 today to take care of your "To Do" list.